The SeaWorld Seven Seas Craft Beer & Food Festival is a culinary dream come true for foodies and craft beer aficionados, who can sample more than 50 foods representing the Caribbean, Europe, the Pacific Islands and Latin America, taste dozens of craft beer selections and sip a dozen wine choices. Seven Seas, featuring 28 new food items this year and a new India Flavors area, takes place weekends March 9–April 28. 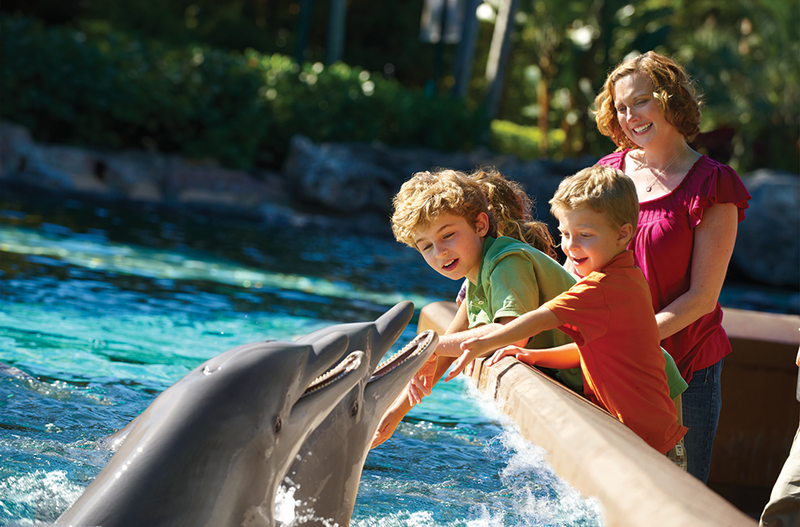 Spread across 190 acres on beautiful Mission Bay Park, SeaWorld® is known for spectacular animal shows, interactive attractions, aquariums, rides, beautiful landscaping and education programs for all ages. SeaWorld® is a world leader in animal care and conservation. Through up-close animal encounters and incredible shows like Dolphin Days®, Orca Encounter®, and Sea Lions Live®, or hands-in attractions like Explorer's Reef®, you'll be inspired to connect with and care for the natural world. Need an adrenaline rush? Soar, dive and twist like a ray on our Manta® coaster, take a spin on Shipwreck Rapids®, or test your nerves on the brand new looping rollercoaster, the Electric Eel®! Electric Eel is the tallest, fastest roller coaster in San Diego! 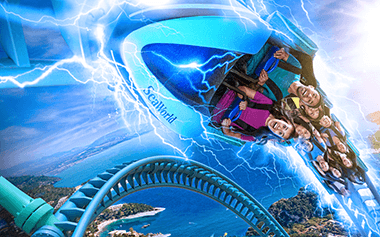 As the newest member to SeaWorld’s riveting collection of attractions, Electric Eel is a multi-launch coaster with high-energy twists, electrifying loops and multiple inversions. Prepare yourself as you accelerate to more than 60 miles per hour in seconds, then rocket skyward nearly 150 feet. While you speed along the track, you'll brave an inverted “heartline” roll and a twisting loop for an exciting feeling of airtime as you reach the peak of the coaster before breathlessly returning to the station. During your visit to SeaWorld®, discover the remarkable rescues and groundbreaking research that makes SeaWorld® so unique and important for wildlife conservation. Over the last 55 years, SeaWorld San Diego has rescued nearly 20,000 animals. While you enjoy all the animal shows, exhibits and education programs SeaWorld is famous for, behind the scenes there is a mission to care for the environment and the animals that extends beyond the park’s borders. Every visit to a SeaWorld park helps support its rescue programs. Seeing animals at a SeaWorld park supports saving them in the wild! Adult (10 years and over) 1-day admission. Valid any one day through 12/31/2019. San Diego, CA. Child (3-9 years) 1-day admission. Valid any one day through 12/31/2019. San Diego, CA. Valid for 2 visits to SeaWorld San Diego for one Adult (10 years and over). Both visits must occur by 9/30/19. Valid for 2 visits to SeaWorld San Diego for one Child (3-9 years). Both visits must occur by 9/30/19. Orders received by 3pm Mon-Fri, except holidays, are processed and emailed the same business day. Non-InstaPrint eTickets are NOT processed on weekends or after 3pm on business days. We suggest adding MyTickets@funex.com to your email address book before placing your order. An email containing your tickets will be sent from MyTickets@funex.com. Adult (Ages 10+) ONE Weekday admission. Valid for one weekday visit Monday thru Friday thru 9/30/19. Must be purchased by 9/27/19. San Diego, CA. These eTickets are NOT processed on weekends or after 3pm on business days. Orders received by 3pm Mon-Fri, except holidays, are processed and emailed the same business day. No returns or refunds. Child (3-9 years) ONE Weekday admission. Valid for one weekday visit Monday thru Friday thru 9/30/19. Must be purchased by 9/27/19. San Diego, CA. Includes one day admission (3 years and over) on any one regular operating day. Also includes dining as often as every hour at SeaWorld participating restaurants. This eTicket is valid thru 12/31/19. Adult (10 years and over). Unlimited visits thru 12/31/2019. Blackout dates on 5/26/19, 7/4, 7/5, 7/27, 8/3, 8/10, 9/1, & 12/29/19. Child (3-9 years). Unlimited visits thru 12/31/2019. Blackout dates on 5/26/19, 7/4, 7/5, 7/27, 8/3, 8/10, 9/1, & 12/29/19.